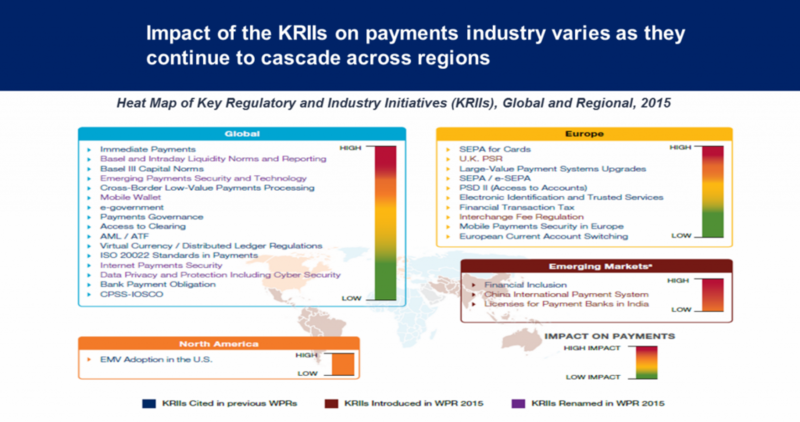 The World Payments Report 2015 has identified that Key Regulatory and Industry Initiatives (KRIIs) relating to immediate payments and cross border low-value payment processing are key areas in the industry that need to be addressed as a priority. During a webinar based on the report hosted by Finextra, real-time payments were cited as a major area of payments that require standardisation and innovation to keep up with customer expectations. Banks need to rationalise their operations and IT to be competitive and keep pace with the payments landscape; however, the webinar highlighted just how far away incumbents are from making this a reality on a global scale. Craig Tillotson, Chief Executive of Faster Payments, explained how real-time payments initiatives had been deployed in the UK. The Faster Payments Service was completed by 2006, but the scheme did not gain momentum until 24/7 processing was introduced in 2011. It is clear that building such an infrastructure has been a major challenge in the UK – even without the headaches of global clearing. An international rollout of real-time payments is not something that incumbents who are tied into legacy banking infrastructures will be able to meet in the immediate future. The introduction of SEPA payments enabled more efficient and faster payment transfers when moving euros from one Eurozone country to another. According to Pierre Petit, Deputy Director of DG Market Infrastructure and Payments at The European Central Bank however, development of a Pan-European scheme for real-time payments is still in its infancy, with a timeline of at least 1-2 years expected. Issues with fragmented infrastructures, particularly between ACHs, as well as compliance and regulation across regions is one of the reasons stated for the slow deployment of a global real-time payment solution. Although the UK is progressing well with domestic real-time payments, Europe and the US are still joining the dots inside their networks. Another topic discussed during the webinar following a question from the audience was whether banks would try to make new or additional revenues out of real-time payments, or whether this is just something they need to offer to keep up with the competition. Despite banks already charging high cross border transfer fees, Jeroen Holscher, Head of Global Payments Practice at Capgemini explained that banks could use real-time payments as a catalyst to provide a value added service to the end client and sell more services, while using the offering to strengthen existing banking relationships. He further commented that real-time payments will allow banks to compete with disruptors, and while he did not state clearly whether he felt banks would or would not use the offering to generate more revenue, he did confirm that if banks can use real-time payments as a way to solve a problem for their customers, theoretically, they could charge for it. At some point, banks will be able to offer a real-time payment solution that connects banking networks across the world to provide a global solution – but it is still a long way off, and is likely to be loaded with the same charges that are already in place. Until traditional banks realise that customers want a fast, low cost and transparent solution, disruptors like Banking Circle will continue to surpass them..